The GIScience conference is being held every two years since 2000, and it is one of the main conferences in the field of Geographic Information Science (GIScience). It is a special honour to be invited to give a keynote talk, and so I was (naturally) very pleased to get an invitation to deliver such a talk in the conference this year. The title of my talk is ‘Has GIScience Lost its Interdisciplinary Mojo?’ and I’m providing here the synopsis of the talk, with the slides. My own career is associated with GIScience very strongly. In 1992, as I was studying for my undergraduate studies with a determination to specialise in Geographic Information Systems (GIS) by combining computer science and geography degrees, I was delighted to discover that such studies fall within a new field called GIScience. The paper by Mike Goodchild that announced the birth of the field was a clear signal that this was an area that was not only really interesting, but also one with potential for growth and prospects for an academic career, which was very encouraging. This led to me to a Masters degree which combined environmental policy, computer science, and GIS. During my PhD, I started discovering another emerging area – citizen science, with two main pieces of work – by Alan Irwin and Rick Bonney marking the beginning of the field in 1995 (I came across Irwin’s book while looking into public understanding of science, and learn about Bonney’s work much later). According to OED research, the use of citizen science can be traced to 1989. In short, GIScience and citizen science as a recognised terms for research areas have been around for about the same time – 25 years. Over this period, I have experienced an inside track view of these two interdisciplinary research fields. I would not claim that I’ve been at the centres of influence of either fields, or that I’ve analysed the history of these areas in details, but I followed them close enough to draw parallels, and also to think – what does it mean to be involved in an interdisciplinary field and what make such a field successful? The use of terms in publications is a good indication to the interest in various academic fields. Here are two charts that tell you how GIScience grown until it stalled around 2010, and how citizen science have been quiet for a while but enjoying a very rapid growth now. First, from Egenhofer et al. 2016 Contributions of GIScience over the Past Twenty Years, showing the total number of publications with the keywords GIS or GIScience, based on a Scopus query for the years 1991 through 2015, executed in July 2015. Notice the peak around 2009-2010. I think that it’s fair to say that these two fields as inherently interdisciplinary. In GIScience, as Traynor a Williams identify already in 1995: “Off-the-shelf geographic information system software is hard to use unless you have sufficient knowledge of geography, cartography, and database management systems; are computer-literate” and to these observations we need to add statistics, algorithms development, and domain knowledge (ecology, hydrology, transport). Citizen Science also includes merging knowledge from public engagement, education, science outreach, computer science, Human-Computer Interaction, statistics, algorithms and domain knowledge (e.g. ecology, astrophysics, life science, digital humanities, archaeology). Both fields are ‘more than a methodology‘ – they are contributing to scientific research on different problems in the world, and only a very reductionist view about what they are will see them as ‘a tool’. They are more complex than that – which is why we have specific scholarship about them, periods of training, dedicated courses and books, conferences and all the rest. A very shallow comparison will note that GIScience was born as an interdisciplinary field of study, and experience consolidation and focus early on with research agendas, core curriculum which was supposed to lead to stability and growth. This did not happen (see Patrick Rickles comments, from an interdisciplinary research perspective, on this). Take any measure that you like: size of conferences, papers. Something didn’t work. Consider the Esri UC, with its 15,000 participants who are working with GIS, yet only a handful of them seem to be happy with the identity of a GIScientists. In contrast, Citizen Science is already attracting to its conferences audience in the many hundreds – the Citizen Science Association have 4000 (free) members, The European Citizen Science Association 180 (paid) – and that is in the first 2 years since they’ve been established. It doesn’t have an explicit research agenda, and have an emerging journal, but the field also benefits from multiple special issues – there is almost a competition among them. The wider engagement with these fields is also linked to my personal and direct engagement in GIScience research that goes beyond disciplinary boundaries. Over the years, I was also involved in about 20 multidisciplinary, cross-disciplinary, interdisciplinary, and transdisciplinary projects. I also found myself evaluating and funding x-disciplinary projects (where cross, inter, multi or trans stand for x). The main observations from all these is that many times, projects that started under the interdisciplinary flag (integrating knowledge from multiple areas), ended with mostly multidisciplinary results (each discipline addressing the issue from its own point of view). However, here are nine lessons that I’ve learned, which can also help evaluating the wider fields of GIScience and citizen science. First, Get them young & hungry – when established professors are joining an interdisciplinary project, usually they have a clear personal research agenda, and the likelihood that they will be open to radically new ideas about their area is low. You can get excellent multidisciplinary projects with experienced researchers, but it is much harder and rarer to have interdisciplinary or transdisciplinary project – there is too much to lose. That mean that early career researchers are the most suitable collaborators who can develop new directions. At the same time, in terms of job potential and publications, it is very risky for PhD students to get into interdisciplinary research as this can reduce their chances of securing an academic job. With appropriate funding (as we done in Bridging the Gaps) and specific support to people at the more secured stage of early career (after securing a lectureship/assistant professor position), we’ve seen interdisciplinary collaboration evolve. Third, there are also cases of being undermined, intentionally. Interdisciplinary proposal are evaluated by experts from different fields, and no matter how much they are told to focus their comments on their discipline, they will comment on other aspects. Moreover, proposal evaluators can assess the novelty in their area, not the overall innovation, reducing the likelihood of ‘outstanding’ mark that make it more likely to get funded. For example, in an early version of what was now funded by both EPSRC and ERC, a Research Challenges Board rejected the proposal because it “seemed so high risk to us is that there are many links in the chain… is it clear that even if everything works there would be real value from these sorts of devices? You use the example that the forest people might be able to tell if there were poachers in the area. Yet can that really be shown? Do forest people understanding probabilistic reasoning? If there any evidence that illiterate people can use maps, digital or otherwise?“. It’s important to note that both ERC and the EPSRC programmes were aimed at risky, interdisciplinary projects, but in more standard programmes, it is difficult to get funded. Fourth, look out for the disciplinary scrounger. They might not be aware that they are disciplinary scrounger, but this is how it happens: Interdisciplinary research open up new tools and methodologies and people who know how to use them for the research team as a whole. While there is a supposed shared goals that will provide benefits to all sides, a savvy researcher will identify that there is an opportunity for using resources to advance their own research in their discipline, and find ways to do that, even if there are no apparent benefits to the side that give the resources. This act is not necessarily malicious – from the researcher perspective, it is exactly a demonstration of interdisciplinary contribution. Sixth, consider the in-built misunderstanding. Terminology is an obvious one. For Anthropology, scale, from small to large is individual, household, community – and for cartography city is small scale, while house is large scale. However, these are easy – it can take time, and long discussions to discover that you’re looking at the same thing but seeing something completely different. 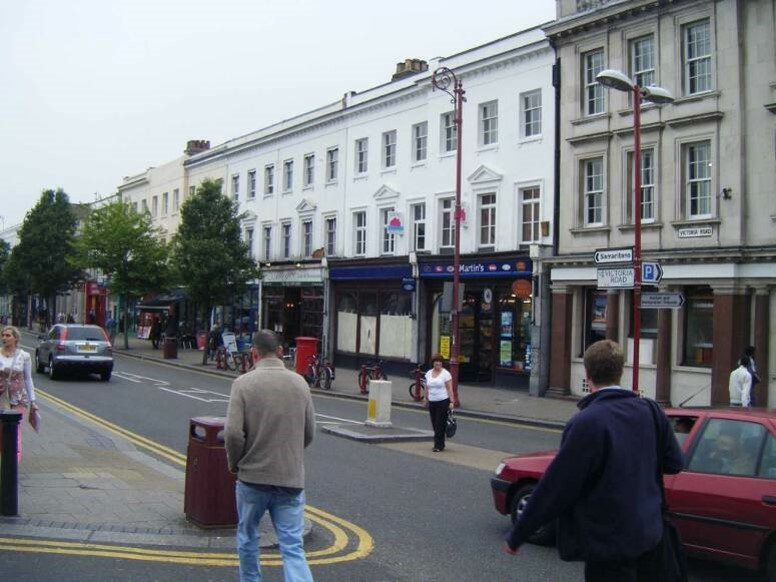 As Kate Jones suggested when she worked on the Successful Suburban Town Centres project. In the image above urban designers see the streets, but not the people, while human geographers who look at census data will tend to see the people, but not the urban structure that they inhibit. There are many other examples of subtle, complex and frustrating misunderstanding that happen in such projects. Seven, there will be challenges with publications – those that are written. Publications are critical academic outputs, and important for the individuals, teams, and the project as a whole. Yet, they are never easy – different disciplines have very different practices. In some, the first position in the author list is the most important, in another, the last. Some value single author monograph (Anthropology), other conference paper with multiple authors (Computer Science). This creates tensions and a need for delicate discussions and agreement. Moreover, and linked to Six – writing joint publications is an opportunity to expose interdisciplinary misunderstanding, but that make the writing process longer. Eight, it is important to realise that many times interdisciplinary publications will never be written – because academic careers, promotion criteria, visibility, and recognition depends on disciplinary practices, within projects disciplinary papers and outputs are written first. The interdisciplinary outputs left to a later stage – and then the project end and they never get written. They are actually dependent on voluntary investment of multiple contributors, which make it very difficult to get them done! Finally, nine, is the importance of coffee and lunch breaks (and going out together). Team members in interdisciplinary projects are usually coming from different departments, and it is challenging to organise a shared space. However, by putting people together – computer scientists sitting next to a geographer, designer, anthropologists – it is possible to achieve the level of trust, relationship and the development of new ideas that are needed in such projects. In ExCiteS, we have a designated ‘social officer’ for the group. On the basis of these experiences, I’d argue that Interdisciplinarity is always hard, risky, require compromises, accommodations, listening, and making mistakes. The excitement from the outputs and outcomes does not always justify the price. Frequently, there is no follow-on project – it’s been too exhausting. The analysis that Patrick Rickles done across the literature can provide you with further information on challenges and solutions. Considering the project level challenges, viewing interdisciplinary areas of studies emerging is especially interesting. You can notice how concepts are being argued and agreed on. You can see what is inside and what is outside, and where the boundary is drawn. You can see how methodologies, jargon, acceptable behaviour, and modes of operations get accepted or rejected – and from the inside, you can nudge the field and sometimes see the impact of your actions. Here are some observations about GIScience and citizen science evolution. First, citizen science seem to be growing organically, without a deliberate attempt to set a research agenda, define core curriculum, or start with nationally focused research centres, in contrast to GIScience, who had all of these. There is an emergent research agenda: data quality, motivations & incentives, interaction design, management of volunteers, and more. These are created according to views of different people who join the research area, opening opportunities for new collaborations. It is noted that GIScience, in practice, allowed for many other areas to emerge – for example crowdsourcing, which was not in the last version of the research priorities that are listed on UCGIS website, and also seemed to stop doing these exercises. Second, there is an interesting difference in inclusiveness. Although there are different variants of citizen science, across events, conferences and projects, there is an attempt to be inclusive to the different variants (e.g. volunteer computing or ecological observations) though tensions remain and need maintenance. In GIScience, there have been inclusive activities, of workshops that brought together people from Human-Computer Interaction in the late 1980s, or the excellent series of meetings about GIS and Environmental Modelling. There is clear separation, for example in spatial analysis, where different methods are now appearing in ecology, but they are not shared back with the general GIScience. It is worth considering how to make such events and consider active inclusiveness, where researchers from different areas will find their place and reasons to participate. It might be that citizen science is also more inclusive because of the interaction with people outside academia (participants) and the need to focus on things that matter to them, whereas GIScience has largely been for/by scientists. 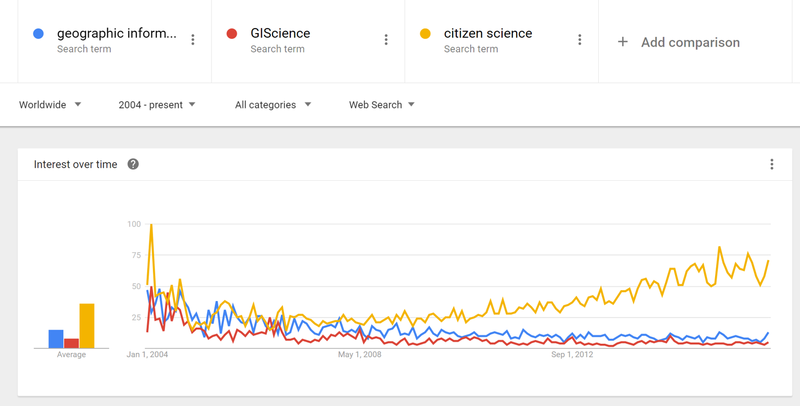 However, citizen science gets backlash for “not doing REAL science”, but it’s still grown. Maybe, in the process of GIScience trying to validate itself, it’s cut itself off from other research areas (even though GIS use continues to grow)? Third, there is a sharp difference in the relationship with practitioners – GIScience decided to focus on fundamental questions and laws, while citizen science is a deliberate integration between researchers (the science of citizen science) and practitioners who are running volunteering programmes. The interaction between practice and science is bringing research questions to light and provide a motivation for addressing them with interdisciplinary teams. It might be that separation between science and systems in GIScience need to be blurred a bit to open up new opportunities. Finally, GIScience benefited from having a disciplinary name, and attention by a growing group of researchers who are committed to the field – job titles, positions, journals and conference do matter in terms of visibility and recognition. Citizen science, on the other hand, is only now starting to have a proper home and networks. There are ongoing discussions about what it is, and not everyone in the field is using the term ‘citizen science’ or happy with it. The actual conference that led to the creation of the Citizen Science Association was titled ‘Public Participation in Scientific Research'(!). The coherence and focus on understanding how important key phrases are, more than dislike of their potential meaning is valuable for the coherence of a field and stating that you have knowledge that can be shared with others. To complete this discussion, I point to the opportunities that citizen science open for interdisciplinary collaborations with GIScience – It provides examples for longevity of VGI data sources, that can be used to address different research questions. There are new questions about scales of operations and use of data from the hyper local to the global. Citizen science offer challenging datasets (complexity, ontology, heterogeneity), and also a way to address critical issues (climate change, biodiversity loss). There are also usability challenges and societal aspects. In final account, GIScience got plenty of interdisciplinary activity in it. There are actually plenty of examples for it. In terms of ‘mojo’ as being attractive for researchers from other area to join in, there are plenty of opportunities – especially if the practice of using GIS within different research and practice problems is included in the framework of GIScience. This post benefited from discussions and comments from Patrick Rickles, who is our local expert in GIS use in an interdisciplinary settings. You should check his work.